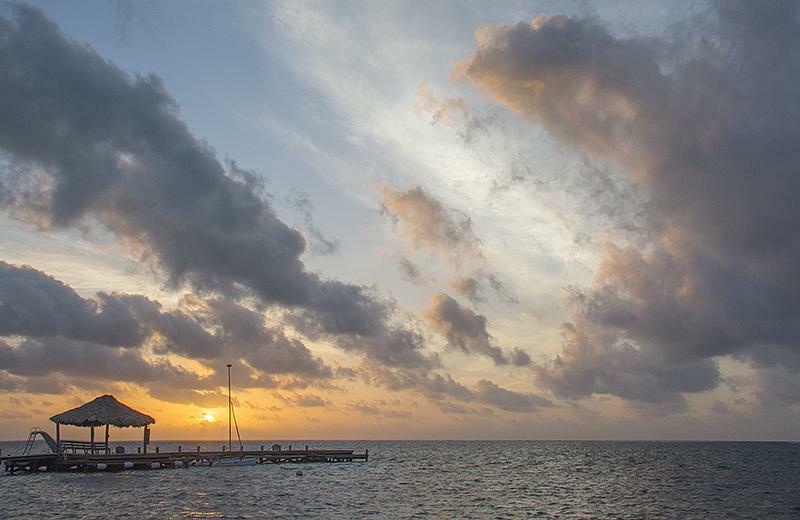 Belize NMS: Mainly fair, warm and mostly dry conditions continue today. A slight increase in moisture is expected tomorrow. 24-hour forecast: Mostly sunny today with little or no rainfall. Partly cloudy tonight with isolated showers and isolated thunderstorms. Winds: East - southeast 10-20 knots. Today: Winds: E-SE 10-20 kt. Seas: Choppy - moderate. Waves: 3-6 ft. Mainly fair and dry. Tomorrow: Winds: East 10-20 kt. Seas: Moderate. Waves: 4-6 ft. A few showers and isolated thunderstorms. Marine Outlook: (Monday night) Winds: East 10-20kt. Seas: Moderate. Waves: 4-6 ft. A few showers and isolated thunderstorms. General Outlook: For Monday and Monday night is for cloudy skies at times with a few showers and isolated thunderstorms across the country. Just beautiful today on Ambergris Caye. The sun is shining and the breeze is ESE at 9 mph. The expected high is 89. No rain anywhere on the Radar for 400 km . ... Increased cloud cover this morning. 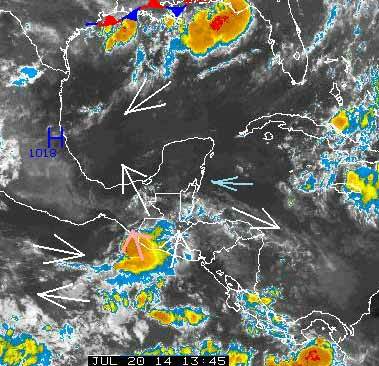 There is another bubble of weather moving up from the south, putting its winds out in many directions, one sweeping out over Belize, going in an easterly direction, causing more cloud over Belize, but not rain.